Ancestry.com announced that it has been co-developing a new Ancestry gateway with Software MacKiev. The result of that collaboration is going to be released at the end of March 2017. As you may recall, Ancestry.com retired their Family Tree Maker desktop software in 2015. At that time, Ancestry said they would support Family Tree Maker through at least the end of 2016. This made many Ancestry.com users very upset. Ancestry.com recently stated that their goal has been to maintain the capability for people to share their family tree data between files on their computer with their personal Ancestry online trees. To reach that goal, Ancestry has been co-developing a new Ancestry gateway with Software MacKiev. FamilySync will be available only in Software MacKiev’s Family Tree Maker 2017 edition (which will be released on March 31, 2017.) Between March 29 and March 31, there will be a short period where syncing functionality might be interrupted as Software MacKiev rolls out their new syncing technology. Things should return to full functionality after March 31. As of March 29, 2017, Ancestry will no longer be supporting TreeSync. 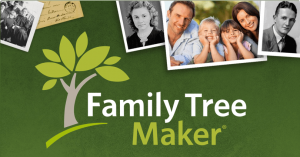 Software MacKieve will continue to handle all related customer questions for Family Tree Maker. Users who have questions should visit Software MacKiev’s Family Tree Maker Support Center at support.familytreemaker.com. The Family Tree Maker upgrade is free for all users who purchased a copy of MacKiev Family Tree Maker since March 1, 2017. Those with previous Ancestry editions, or who got a free copy of Family Tree Maker 2014.1 or Mac 3.1 are eligible for discounted upgrades. The pre-order upgrade is $29.95 for those who sign up for Software MacKiev’s mailing list before March 29, 2017. After that date, the upgrade will continue to be a discounted price – $39.95 – for a limited time after March 29, 2017. The minimum system requirements for Family Tree Maker for Mac are: OS X 10.8 or later, including macOS Sierra 10.12, 500 MB hard disk space, 2 GB of RAM. The minimum system requirements for Family Tree Maker for Windows are: Windows 7 and later, including Windows 10, 675 MB hard disk space, 2 GB of RAM, 1024 x 768 resolution.